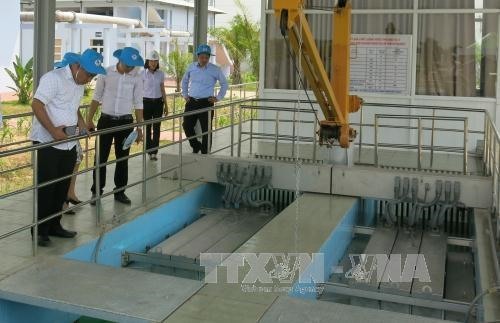 BÌNH DƯƠNG — The southern province of Bình Dương on Friday put into operation a wastewater treatment plant in Thuận An Town, the second of its kind in the province. Trần Thanh Liêm, deputy chairman of the People’s Committee, said that with a capacity of 17,000cu.m per day in the first phase, the plant would collect and treat wastewater for 40,000 households, which will help ensure the community lives in healthier conditions as well as contribute to realising the national environment protection strategy. Households near Ba Bò canal will benefit greatly from the project. Currently, it is one of the most polluted canals as wastewater from the households flows into it. The plant will reduce the canal’s pollution level. The plant’s capacity is expected to double in the second phase. A part of the Nam Bình Dương water environment improvement project, the plant’s total investment comes to nearly VNĐ2.5 trillion (US$110 million). Around 85 per cent of this amount comes from Japan’s Official Development Assistance (ODA) source, and the rest is from the local budget.